ArtPlace America partnered with Transportation for America (T4A) in 2017 to lead our transportation sector field scan research and co-convene our transportation working group. We are in the process of identifying a series of next steps to develop creative placemaking resources for state-level transportation officials, and in the meantime are supporting T4A’s ongoing work via the National Complete Streets Coalition and Smart Growth America’s 2018 conference, Intersections: Creating Culturally Complete Streets. The convening will bring together national practitioners, advocates, and thought leaders in the Complete Streets and Creative Placemaking movements to explore practical ways to integrate arts and culture in the creation of streets that not only are safe for everyone, but also better reflect the unique character of their communities. Stay tuned for more information about our forthcoming work with Transportation for America. 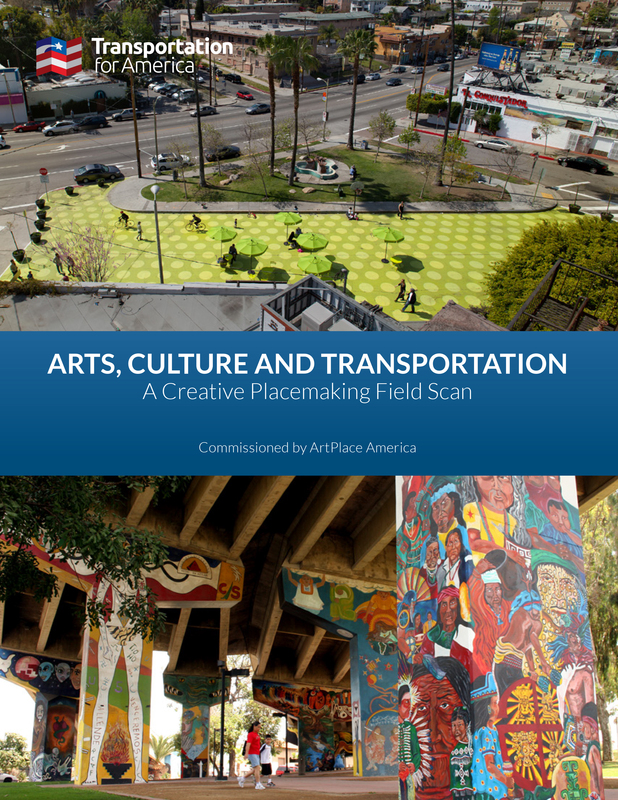 Arts, Culture and Transportation: A Creative Placemaking Field Scan is a rigorous national examination of creative placemaking in the transportation planning process. Commissioned by ArtPlace and authored by Transportation for America, this resource published in September 2017 identifies ways that transportation professionals can integrate artists to deliver transportation projects more smoothly, improve safety, and build community support. Generating creative solutions for entrenched transportation problems. Making streets safer for all users. Engaging multiple stakeholders for an inclusive process. Alleviating the disruptive effects of construction. Download the full field scan or explore the Seven Challenges, Seven Solutions on the Transportation for America website. Unlike San Diego, California and Tijuana, Mexico, which are separated by 20 miles, El Paso, TX and Ciudad Juárez, Mexico sit adjacent to one another, separated only by the width of the Rio Grande and the invisible international border between the United States and Mexico. Until 1846, El Paso was in fact part of Juárez and Mexico, and the two independent cities today form the world’s largest binational metroplex, with thousands of daily crossings by foot, car, and bus; billions of dollars of trade; and five border crossings connecting the two cities and region. For generations, residents on both sides of the border have crossed frequently for work, school, recreation, and to visit family; more than 80% of El Pasoans identify as Latinx. Until 1974, these border crossings were facilitated by an international streetcar system that connected the downtowns of both cities. As in many American cities, the streetcar system ran President’s Conference Committee (PCC) streetcars, with a sleek Art Deco design that was introduced after the Great Depression, to lure new car owners back onto public transportation. Thanks to the region’s dry climate, the streetcars have remained in relatively good shape for the past four decades. Now that drug cartel-related violence in Juárez has drastically decreased, interest in exploring improved border crossings has increased. 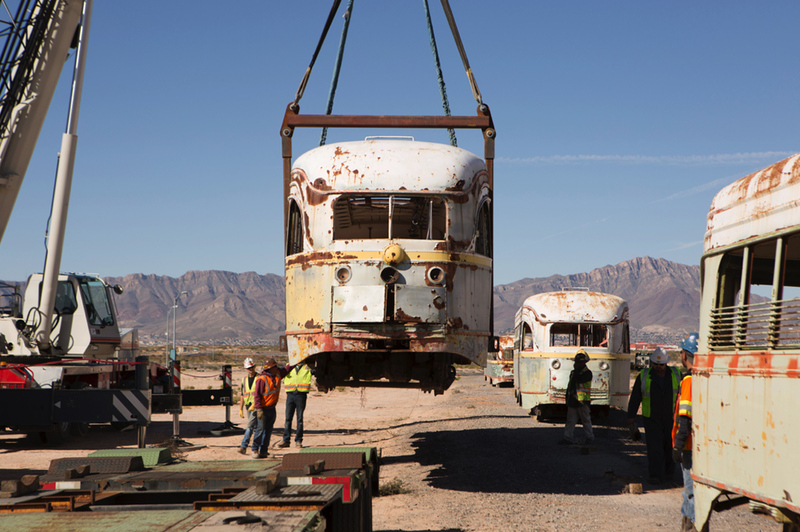 The iconic streetcars, stored in the open desert at the edge of El Paso, and stories of their transnational past, served as the inspiration for Peter Svarzbein’s Masters of Fine Arts thesis project at New York’s School for Visual Arts. In 2012 Mr. Svarzbein, a native of El Paso, created the El Paso Transnational Trolley, which could be described as part performance art, part guerrilla marketing, part visual art installation, and part fake advertising campaign. The project began with a series of wheatpaste posters advertising the return of the El Paso-Juárez streetcar, and continued with the deployment of Alex the Trolley Conductor, a new mascot and spokesperson for the alleged new service. Alex appeared at Comic Cons, public parks, conferences, and other public spaces to promote the return of the streetcar, while additional advertisements appeared across El Paso, sparking curiosity and excitement for the assumed real project. Eventually, Svarzbein admitted that the project was a graduate thesis masquerading as a streetcar launch, but rather than graduating and moving on, he decided to move back home to El Paso. When Svarzbein learned that the City of El Paso planned to sell the historic PCC streetcars, he lobbied the city to cancel the sale, and instead return the streetcars to the streets of El Paso. After gathering thousands of signatures in support of the project and with synergy from the City of El Paso and Texas Department of Transportation (TxDOT) Commissioner, Ted Haughton, the El Paso trolley won a $97 million grant from the TxDOT. It is now slated to begin service in El Paso in 2018. The third phase of the project will include a connection to the Medical Center of the Americas, while the second will include the much anticipated transnational connection to Juárez. Not long after this funding was awarded, Svarzbein rode the wave of public support for the fictional project to win a seat on El Paso’s City Council. The El Paso Transnational Trolley Project’s website quotes artist Guillermo Goméz-Peña: “An artist thinks differently, imagines a better world, and tries to render it in surprising ways. And this becomes a way for his/her audiences to experience the possibilities of freedom that they can’t find in reality.” Clearly, Svarzbein credits his creative campaign with helping to get the project off the ground and building the community support needed to win funding, claiming that "there is a sort of responsibility that artists have to imagine and speak about a future that may not be able to be voiced by a large amount of people in the present. I felt that sort of responsibility. If I couldn't change the debate, at least I could sort of write a love letter to the place that raised me." Adjacent to Washington, DC’s northeast border lies the city of Takoma Park, a multi-ethnic community bounded on the east by New Hampshire Avenue, a six-lane state highway and heavily trafficked artery. Developed in the 1940s and 50s to to prioritize vehicular commuting traffic over pedestrians, it poses an obstacle to social connection and is dangerous for those who walk along it or cross it. In the last decade, a large number of new residents from India, El Salvador, China, Ethiopia, and other countries have moved to the corridor and opened small businesses along the avenue. The corridor boasts multiple Halal butchers, a weekly farmer's market run by the Latino community, and the oldest sari store in the United States. These new residents walk and ride public transit more frequently than legacy residents of Takoma Park, and the auto-centric design of the avenue is dangerous for residents trying to navigate the busy thoroughfare. As such, this has also limited its potential to thrive economically as the main street or commercial hub of the community. Working to improve the visitor and resident experience and safety along New Hampshire Avenue, the Housing and Community Development Department of the City of Takoma Park invited community-engaged dance company Dance Exchange, led by Executive Artistic Director Cassie Meador and founded by renowned artist Liz Lerman, to develop a project that could shift the narrative of a place defined by its transportation challenges. Building on work the City of Takoma Park had already begun through the “New Ave” initiative, Dance Exchange’s New Hampshire Ave: This is a Place to… project used both a “traveling” strategy that encompassed the length of the corridor, and a “gathering” strategy that drew together participants around the avenue’s central green space, as detailed in the National Endowment for the Art’s How to Do Creative Placemaking. Participants included residents, community leaders, property managers, and business owners. Dance Exchange and their partners invited city staff and the people who live and work along the corridor to explore and share about their relationship to each other and the avenue, using the tools of dance, visual art, sculpture, installation, photography, storytelling, performance, dance-making, and the project’s signature colorful chairs out along the avenue. 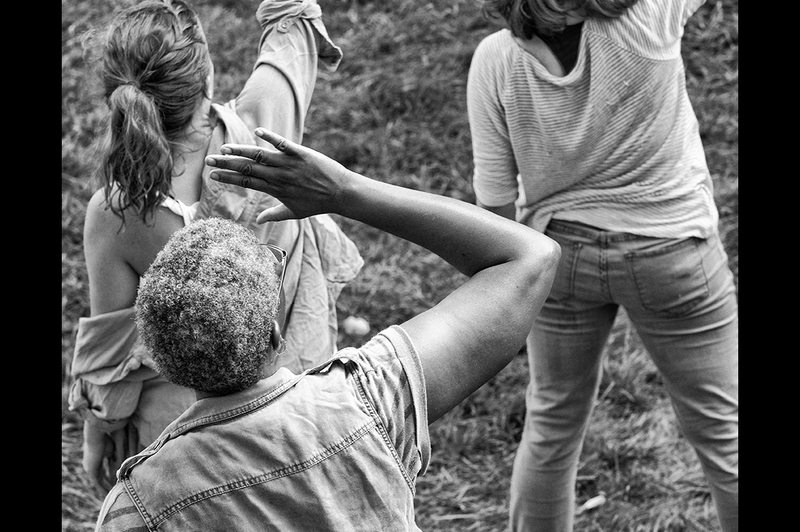 The project kicked off in 2014 with a one-day community festival along New Hampshire Avenue where attendees created dances about their journeys to, and life along, the Avenue. Throughout the course of over a year, New Hampshire Ave: This is a Place to… explored the project’s six main questions: What brings us to this place? What traditions do we carry here? Which do we leave behind? How do our diverse experiences and journeys to the corridor shape the place today? What keeps us here? What do we hope for the future of the avenue? Concurrently, Dance Exchange held a series of workshops for staff of the Takoma Park Housing and Community Development Department that focused on improving the ways in which the city talks to residents during planning processes. Through techniques that included Liz Lerman’s Critical Response Process (CRP), the workshops focused on incorporating local cultural feedback in a planning process, the pressing challenges and opportunities within city management and planning, and the opportunities for creative practices within city administration and planning. For Meador, this project finally made people’s stories and experiences central to the city’s understanding of the Avenue in Takoma Park.The artists reflected that through this multi-pronged process of creating relationships, excavating stories from residents and business owners, and exploring new “cultures of feedback” between city planners and citizens, it remains challenging to measure concrete outcomes. For a project based in a cultural shift towards transportation planning that centers the unique interests and needs of users along New Hampshire Avenue may have a longer timeline. That City staff participated in art-making alongside neighbors, and responded positively to CRP training suggested that the culture of feedback in planning processes were evolving through this project. An artist-led bicycling and art project in the Bronx has brought bicyclers and advocates together to highlight the need for more bicycle infrastructure in the borough. A joint report released by the New York City departments of Health and Mental Hygiene, Parks and Recreation, Transportation, and the New York City Police Department found that from 1996 to 2005, Hunts Point in the south Bronx was one of three locations citywide with a high rate of fatal bike crashes, while central Bronx was noted as one of the top three areas with a concentration of injuries to cyclists. While some safe bicycle infrastructure has since been added in this area, other boroughs received overwhelmingly more bicycling-related development. According to data from New York City’s Department of Transportation, since 2006, the city has added roughly two times the mileage of bike lanes in Brooklyn (102.8 miles) than the Bronx (56.5 miles), even though Brooklyn is only 1.6 times the size of the Bronx. Even within the Bronx itself, the majority of the dedicated bike lanes are concentrated in the north and east Bronx, while the south Bronx has historically experienced a higher rate of poverty and unemployment, and more limited infrastructural investments. Boogie Down Rides not only convened residents during the duration of the project but also intentionally served as a catalyst for ongoing advocacy. 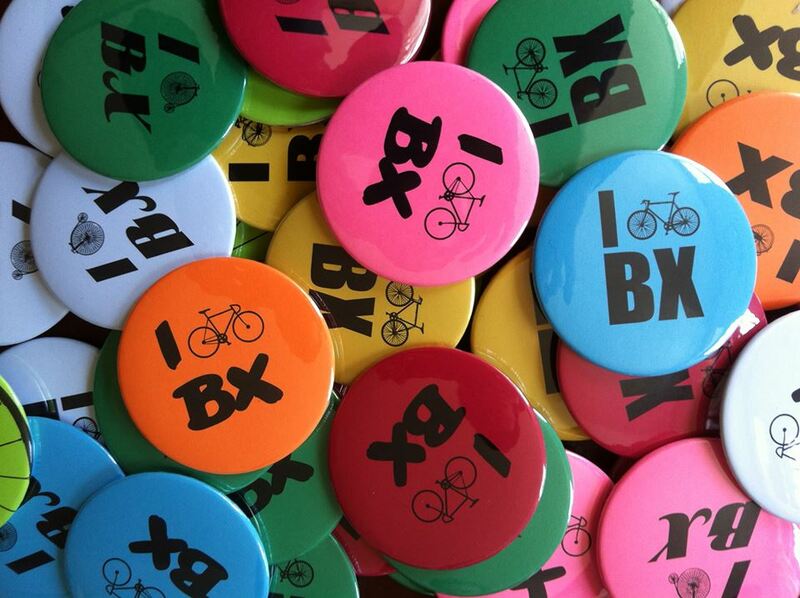 A Bronx cyclist named Mel Rodriguez who formed an advocacy group called Bike the Bronx in 2010, said he “joined the Boogie Down Rides planning committee because he believes the month-long series could lead to longer-lasting changes." A ride on the South Bronx River Greenway motivated community members to work with the artists to create a set of recommendations. Those recommendations were presented in a video of interviews with riders during the South Bronx River Greenway ride, including adding signage, curb cuts, ramps, striping, repairing sidewalks, recalibrated traffic signals, artwork along routes, and creating pedestrian bridges. Elizabeth Hamby explains that as a result of the rides, the local chapter of Transportation Alternatives reignited, and that the capstone event of the programming, Boogie on the Boulevard, was a key component of helping the NYC DOT think about the redesign of Grand Concourse, an historic thoroughfare in The Bronx. When roughly 14 miles of a bus rapid transit (BRT) line was proposed along Division Street in East Portland, the effort was greeted with interest in an often-neglected area of the city, but also concern about the possibilities of displacement and development. To address those concerns, community members throughout the Jade and Division Midway districts were engaged through arts and culture projects to re-calibrate the plan to better serve community needs. Arts-based engagement has helped build a positive dialogue between local agencies and the community to ensure that a new planned bus rapid transit line serves the residents of ethnically diverse, low income districts in the eastern part of the city. 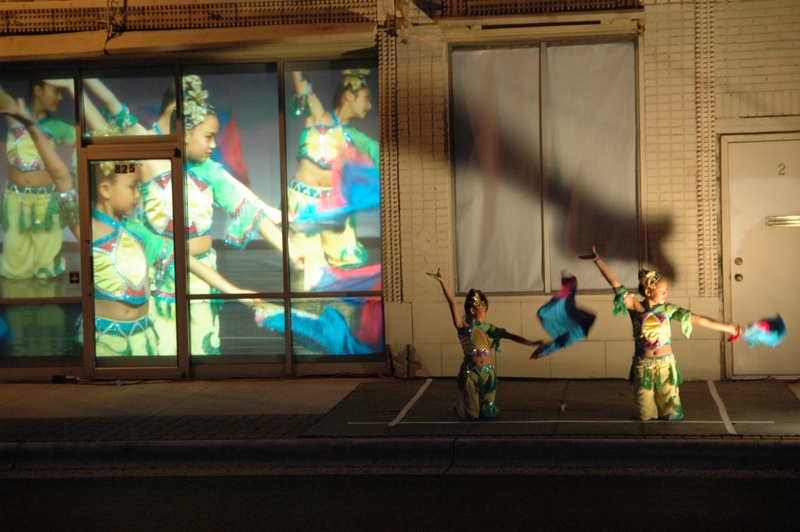 The Asian Pacific American Network of Oregon (APANO) and the Division-Midway Alliance, two nonprofits located respectively in the Jade and Midway districts along Division street in Portland, have been empowering residents, businesses, and students through arts and culture to actively shape the evolving BRT project. This area is home to many immigrant and refugee families that give the area a rich ethnic and cultural diversity, yet it has historically lacked strong, safe transportation infrastructure. In a corridor with members from such diverse backgrounds, creative tactics allow the community to advocate, express, and communicate their desires and interests related to this new transportation proposal to ensure that the final project will best serve their communities’ needs, reflect what makes their community unique, and be embraced by the people and communities it serves. To further build local capacity, the organizations built a placemaking steering committee comprised of eight civic, nonprofit, and government members to guide creative placemaking plans in the district, and ultimately strengthen coalitions. APANO also launched a creative placemaking project grant program, funding the creation of projects in the district led by cultural workers. 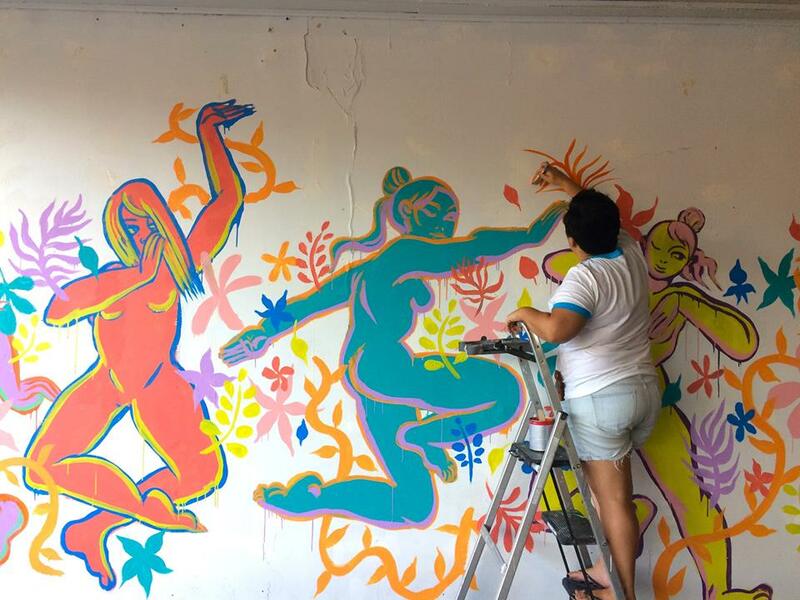 These cultural workers then participated in a cohort known as the resident artist collaborative, in which they receive training to help prepare to produce community-engaged artworks. By building public awareness and political pressure through arts and cultural projects, APANO and the Division-Midway Alliance helped to pause construction of the BRT planning process until the Portland Bureau of Transportation, mass transit agency TriMet, Metro, and others made formal Community Benefits Agreements and agreed to mitigation measures to ensure that the new vital transit service will transform the community in a positive way. Located between Albuquerque and Santa Fe, New Mexico, the pueblo of Santo Domingo (also known as the Kewa Pueblo) is situated along historic roads of commerce and served as a trade center in the early 1920s. Despite the changes to the area over the years, the native population has maintained its traditional social and religious structures and cultivated a rich culture of artistry, specifically in jewelry, basket weaving and pottery-making. After years of transportation disinvestment that disconnected the pueblo from nearby economic hubs, unemployment has risen and roughly a quarter of residents live below the poverty line. Local artists, who account for nearly 75 percent of the population in the pueblo, rely on selling their artistic wares as a main source of income. Yet they are hampered by a lack access to public transportation and the lack of connections to nearby economic hubs and pathways for tourism into the town. 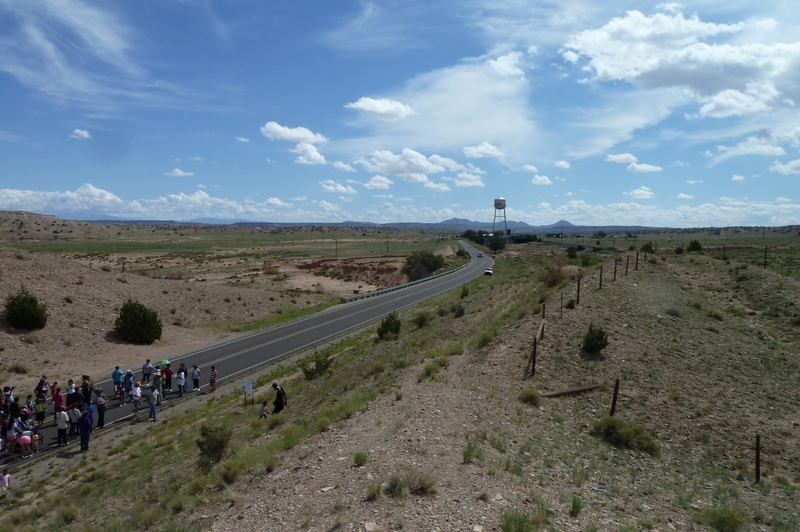 In community meetings, tribal members articulated the need for a safe pedestrian trail on the two-mile stretch between the town, the pueblo housing developments, and the commuter station. Because the community already boasted its own rich artistic assets, this was the tool used to develop the connective trail both for the safety and cultural experience of residents as well as visitors. Atkin Olshin Schade Architects and Olin Studio worked with Kunkel and local artists to develop a plan for an arts trail to feature eight sculptural nodes created by local artists and designed in conjunction with community members, to connect housing to the transit center and out to a new arts market. With the need for employment and the strength of local creative assets in mind, the team hired pueblo artists to design large-scale nodes for the trail that would be visible even by riders on the train. All designs underwent a community vetting process that included pueblo members and tribal leadership. The community also worked with designers Tony Atkin and Laurie Olin to deepen the culturally-specific experience of the trail, and considered this aesthetic to be part of maintaining the safety of the walkway. The team staged charrettes with volunteers and the Santo Domingo Planning Department to explore at the possibility of using these node designs to explain Santo Domingo culture, history and the surrounding landscape. In addition to connecting residential areas of the pueblo with the commuter station, the Arts Trail will lead to the redeveloped Santo Domingo Trading Post, envisioned to serve as an art market where locals will sell their wares to visitors. This facilitates an economic and cultural exchange between both groups and an opportunity to begin to craft a more sustainable platform for exchange that may contribute to more equitable transportation planning processes. The result was an artistic walkway that helped address the shortcomings of an underdeveloped transportation plan for a historically disinvested population in a historically disinvested geography. This last mile of connectivity provides valuable access to a community that critically needed it. However, just the completion of a walkway between these sites would not have been enough. The integration of art into the walkway will make the experience of traveling from home to the Rail Runner station to be uplifting, rather than burdensome; empowering, rather than a constant reminder of systemic neglect; welcoming and safe, rather than a haphazard afterthought; and, in the end, a walkway by and for the people who need it most. Likewise, visitors will be able to more easily reach Santo Domingo and experience it in a way that is culturally enriching and even educational. Arts and cultural tools allowed the tribal community to rewrite its relationship to transportation infrastructure that failed to meet the needs of the population, and instead foster ownership in new transportation infrastructure that serves the pueblo. The Twin Cities of Minneapolis and St. Paul have long been culturally, economically, and geographically linked, but until 2014 they lacked a meaningful, modern rail connection. The Green Line, originally known as the Central Corridor, was a new light rail line planned to run primarily along University Avenue between Minneapolis and St. Paul, home to a large number of immigrants and communities of color. With a disruptive construction project planned, civic leaders feared that months of negative press, dust, and noise might bankrupt businesses and lead to a black eye for the project before it ever opened. In response to this concern, Springboard for the Arts, a nationally recognized community and economic development organization based in St. Paul, the Twin Cities Local Initiatives Support Coalition, and the City of St. Paul created Irrigate, a “community development strategy that mobilizes the skills and creativity of local artists to create innovative, meaningful, authentic solutions to local challenges.” Springboard trained 600 artists from the neighborhoods around the rail line to collaborate with businesses and organizations along University Avenue. 220 of the artists completed 150 creative placemaking projects over 36 months that were designed bring attention, customers, joy and beauty to the spaces and businesses adjacent to the construction. Irrigate projects included musical and theatrical performances in businesses, artistic installations in construction fencing, dance workshops, interactive musical benches, murals, street theatre and performances, and much more. These projects generated more than 51 million positive earned media impressions, which spread stories about the people, neighborhoods and businesses sharing University Avenue and helped to connect new and old customers to the businesses during construction. As Nancy Homans, Policy Director for the City of St. Paul explained. While the City of Saint Paul tried feverishly to garner positive coverage for the benefits of transit that the Central Corridor would bring to the community, their positive message was consistently diluted in the media by negative stories about the impact of construction. As Irrigate projects began popping up along the Corridor...the magic of art started a different conversation. Irrigate’s public process engaging artists from the community to support local businesses provided a nimble and creative way to influence the narrative and change community perceptions of the value of community development. Businesses reported that Irrigate projects helped them maintain visibility and reach new customers, and Springboard felt that the project helped to change the narrative of the corridor, build social capital among neighbors and businesses, and increase the prosperity of small businesses in the corridor. As with many of their successful projects, Springboard published a toolkit for communities who want guidance on running a similar program during construction. Irrigate has also been featured on ArtPlace’s website, in a documentary video, and in T4A’s Scenic Route Guide. For decades, the Chicano community in Barrio Logan, San Diego, thrived as a tightly knit, self-reliant neighborhood. Mexican-Americans began settling in the area as early as the 1890s and have attempted to convince the city to build a park and community space in the neighborhood for decades. In the 1930s, the neighborhood saw an increase of Mexican immigrants arriving to work as laborers, cannery workers, welders, pipefitters, and longshoremen as the city’s new zoning laws allowed for the influx of auto junk yards and industrial development. As the neighborhood began to change, residents found it even more important to make the park a priority. In the mid-1960's, the neighborhood was abruptly bisected by the construction of Interstate 5, an eight-lane freeway that split Barrio Logan in half, disconnecting it from itself. The freeway displaced long-time residents, and became a barrier between residents and businesses in this deeply connected community. Community members viewed the freeway construction as a further step in line with years of disinvestment. In 1969, the State of California finally awarded the City of San Diego a 20-year lease on a 1.8-acre plot of land and passed a state law stipulating that any unused parcel of land near highways could be used as a community recreation area. The site was to be prepared for public use. Despite these plans, on April 22, 1970, neighborhood residents spotted bulldozers and learned that the location for the proposed park was being used to construct a parking lot for a State Highway Patrol station. Neighbors quickly occupied the construction site, and after twelve days, Assistant City Manager Meno Wilhelms announced that city and state officials had agreed to negotiate with the protesters and the newly formed Chicano Park Steering Committee. Eventually the California Department of Transportation (Caltrans) halted construction and the land was returned to the community. The park that local artists and community members created is a reclamation of disruptive transportation infrastructure to better serve the needs of the community, and now serves as a symbol of Chicano autonomy. Chicano Park is internationally recognized for its large-scale murals that depict Chicano and Mexican history and identity, directly painted by local Chicano artists, a sculpture of Mexican revolutionary Emiliano Zapata, and a kiosk resembling an Aztec temple that serves as a stage for performances and events. 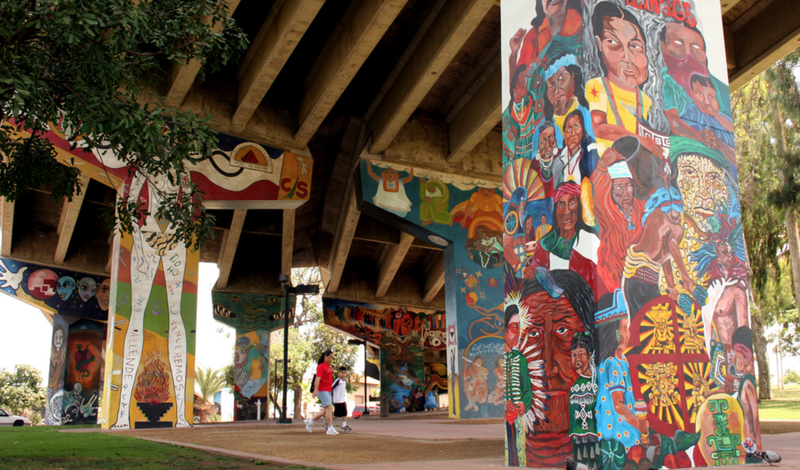 Since the artists have hoped the park would eventually stretch along the underside of the Coronado Bridge all the way to the San Diego Bay, murals are sequentially painted in the direction of the waterfront. The artistic components of the space establish a sense of place, elevate local culture, and convert the infrastructure into an outdoor museum. Chicano Park was listed on the California Register of Historical Resources in 1997, and on the National Register of Historic Places in 2013. The park’s current organizers explain that “Chicano Park becomes the paramount icon of our [community’s] aspiration to control something meaningful in our lives — Chicano Park symbolizes our sacred right to self-determination.” The Barrio Logan neighborhood continues to commemorate an annual Chicano Park Day on April 22, celebrating the initial occupation of the park site.